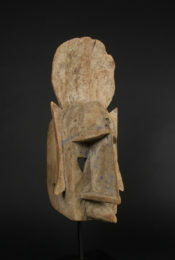 This spectacular mask is distinguished by its expressiveness and power of evocation. 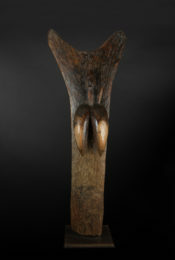 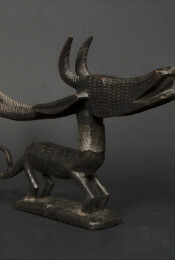 In terms of iconography, it combines the features of a bushcow, the horns of a gazelle / antelope and the snout of a crocodile. 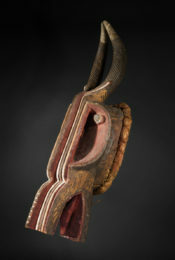 It is painted red, symbolizing blood, strength and power. 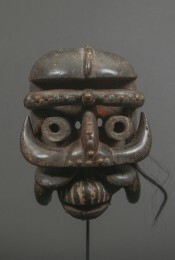 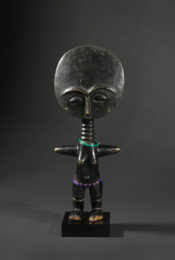 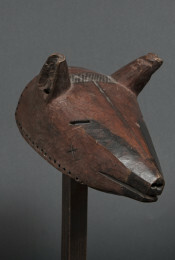 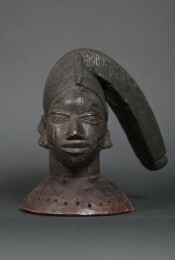 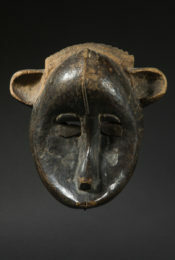 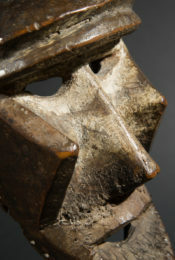 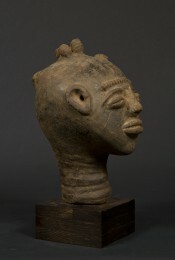 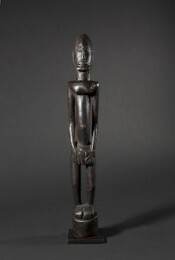 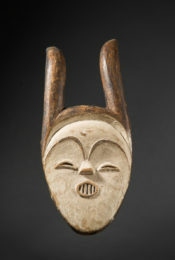 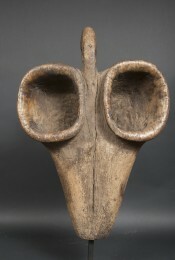 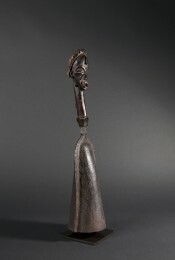 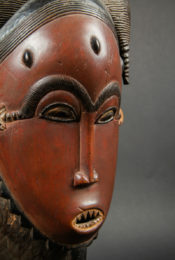 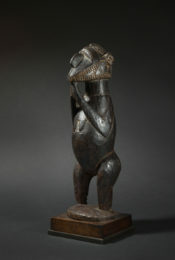 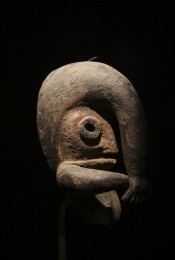 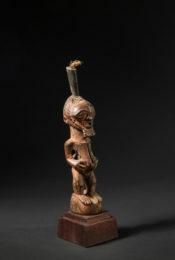 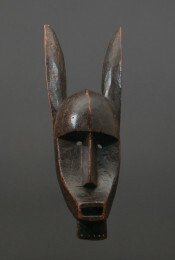 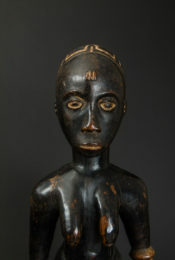 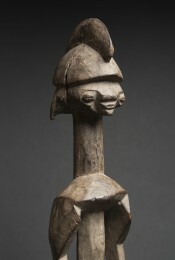 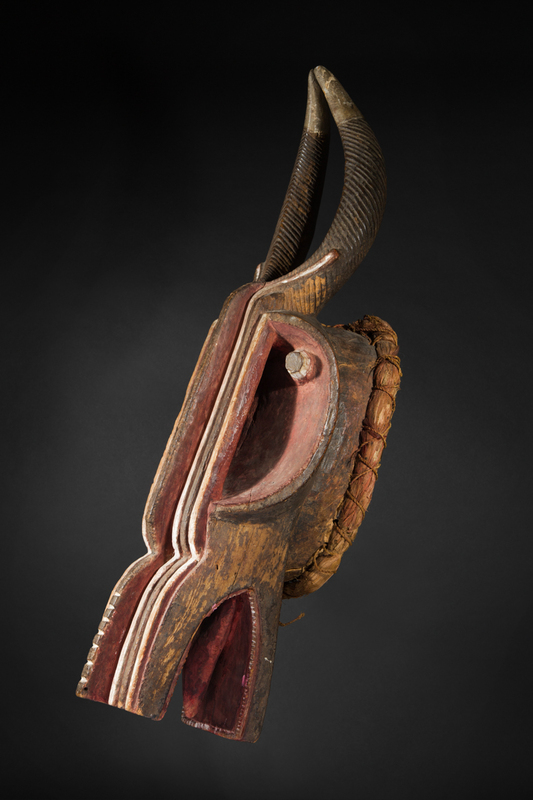 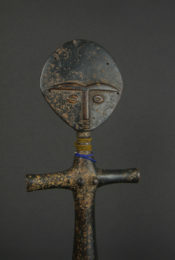 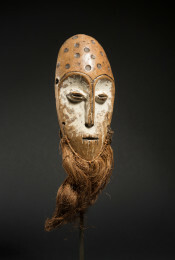 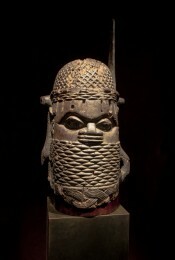 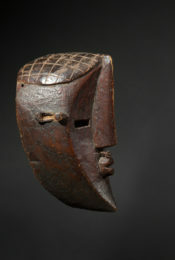 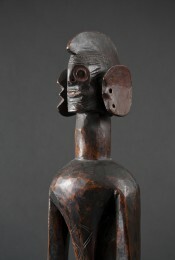 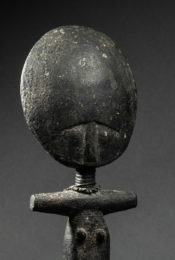 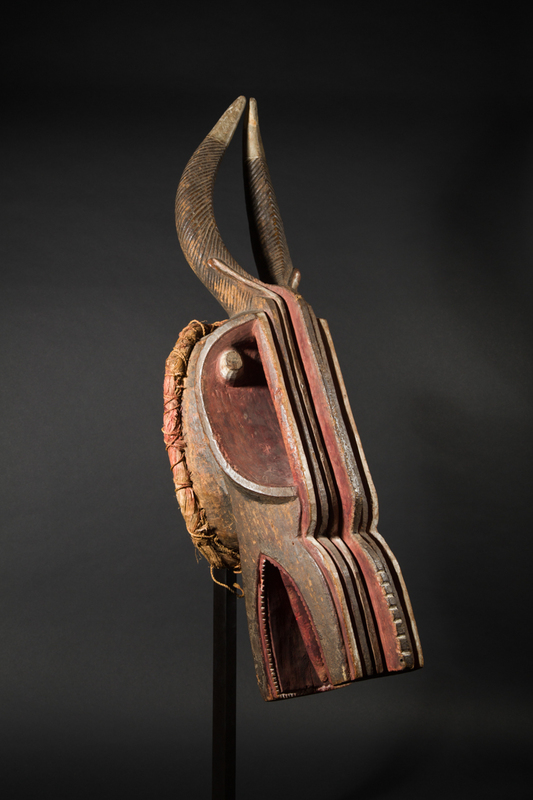 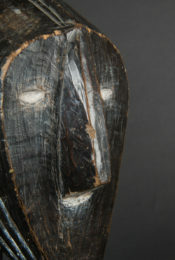 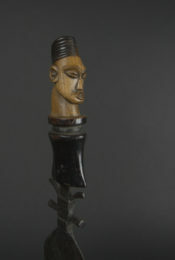 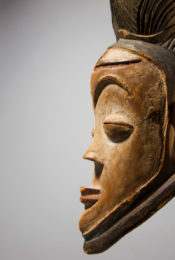 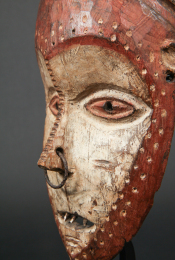 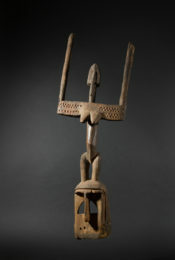 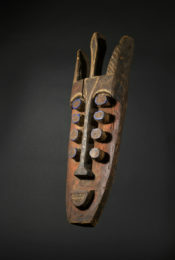 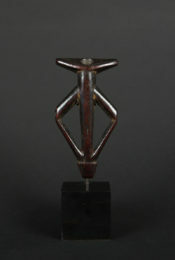 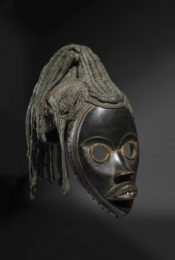 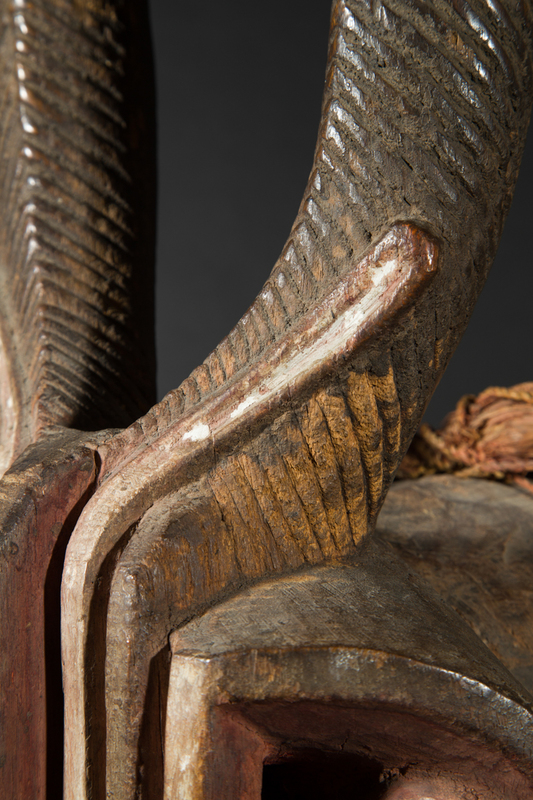 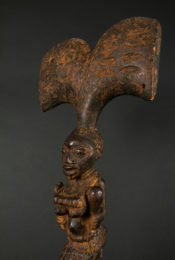 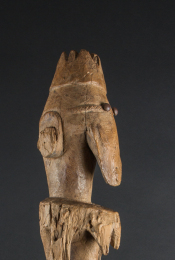 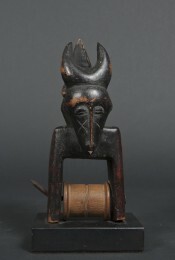 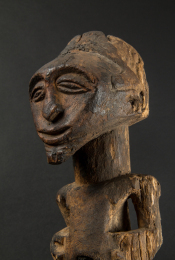 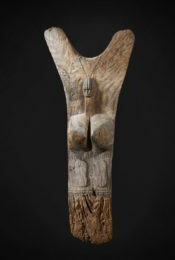 This Baule mask appeared during a ritual ceremony called Goli. 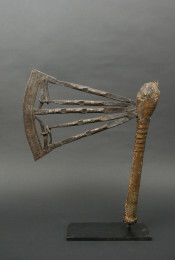 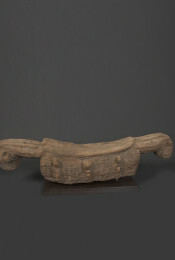 Goli could be performed as an entertainment, for the funeral of important men, on the occasion of the new harvest or for the visit of dignitaries. 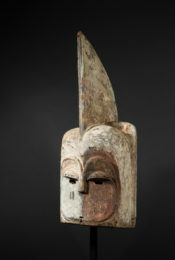 Goli was a day-long spectacle that normally involved the whole village and included the appearance of four pairs of masks including "Goli Glin", a male spirit, the father figure in the Goli family. 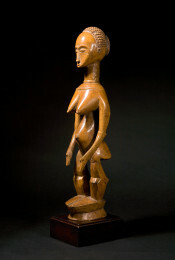 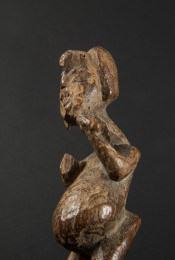 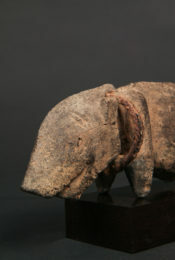 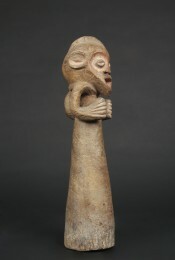 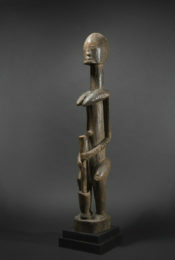 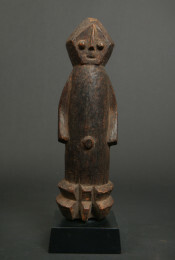 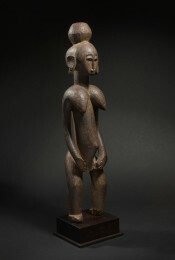 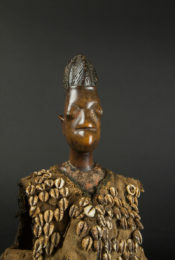 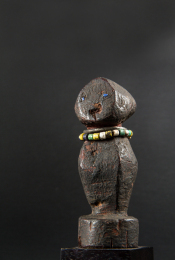 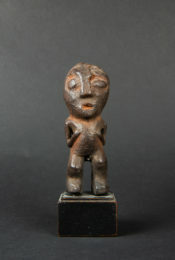 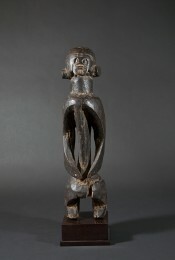 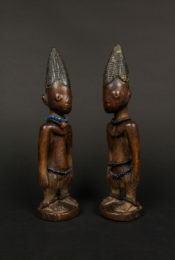 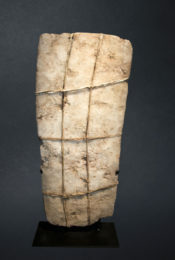 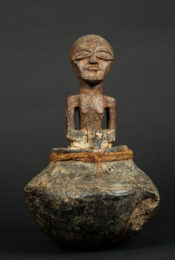 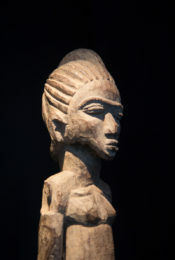 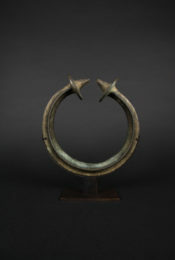 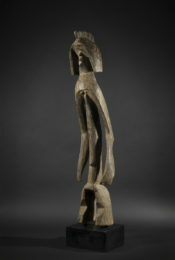 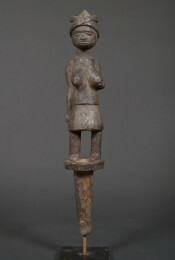 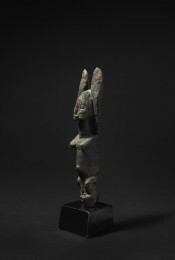 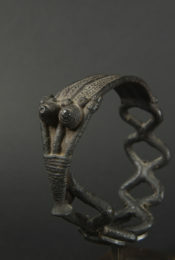 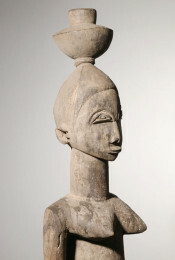 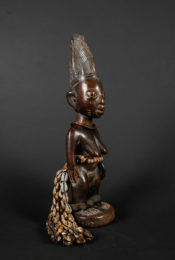 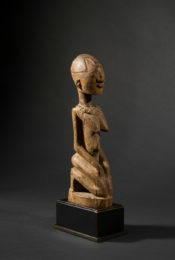 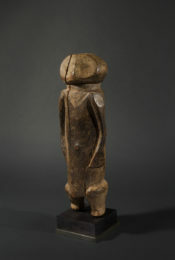 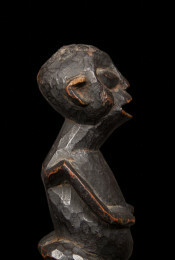 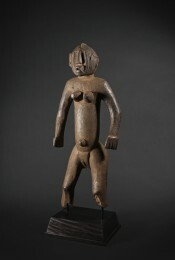 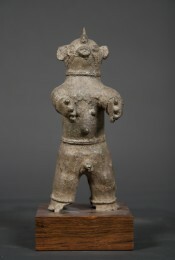 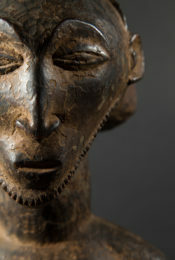 Though connected with supernatural forces, Goli played the role of the intermediaries between the world of the living and that of the spirits. 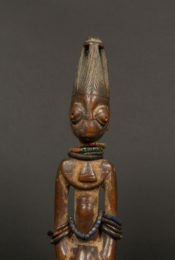 They asked these spirits protection and assistance in case of external danger and war and during epidemics. 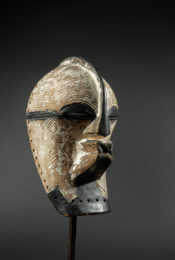 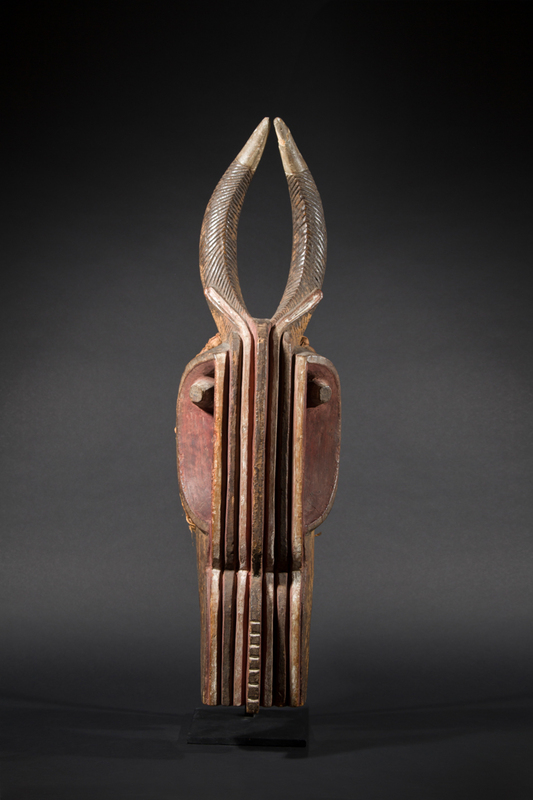 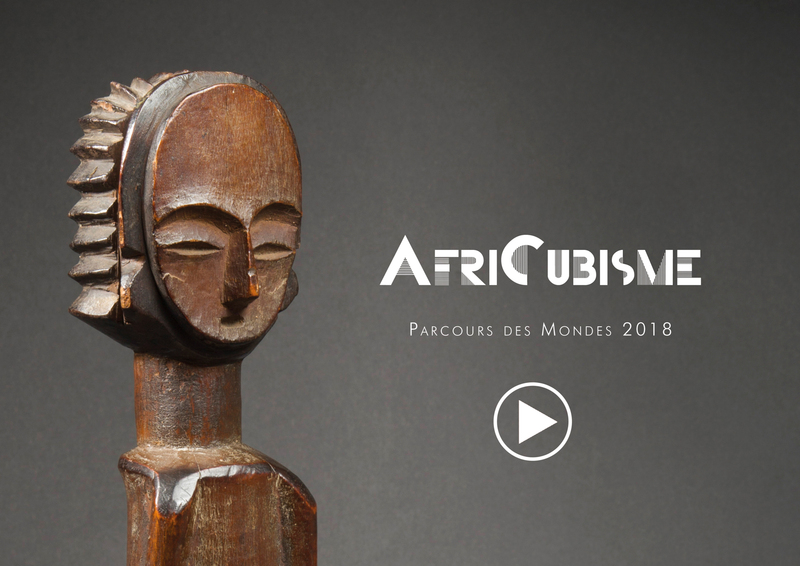 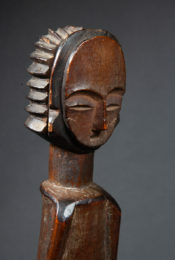 This highly stylized and dramatic mask is remarkably reminiscent of early cubist paintings of guitars by Georges Braque and Pablo Picasso, two great admirers of African art.